First allow me to thank you my sponsors Woolistic for their excellent wool, Detours Bag for the Hightail bag AWESOME!, Nathan Sports for all their reflective gear, hydration and fueling accesories, NiteRider for their Moab lighting system and Showers Pass for their AWESOME lightweight Protech jacket. Alarm goes off at 3:30am. Wait a minute this isn’t normal. Do I really want to get up at 3:30am? Do I really want to go on a 180 mile 13,000 feet of climbing on a tandem? Urrg! That’s how my day, OUR day began. Brandy and I were all snuggled-up in our warm bed when that alarm went off. Even though I haven’t asked her I’m sure the same thoughts went through her pretty little head—it’s too early, it’s too cold it’s too far of a ride etc…We have an hour to get dressed, load up the truck, make bottles, check weather again (something we neglected to do on the 200km or we would have put fenders on the tandem) and get on the road. Ok just one more “snooze”. 4:30am — First order of business FUEL! The truck needed fuel and the Captain and Stoker needed fuel as well. What’s open at 4:30am? Jack in the Box. I had a sausage and egg biscuit — not bad. Brandy had a breakfast burrito and then we shared a croissant with egg or something in it and two large coffees. At that time of the morning I just didn’t care how it tasted. Now the average American shouldn’t have that much calorie and fat laden food. 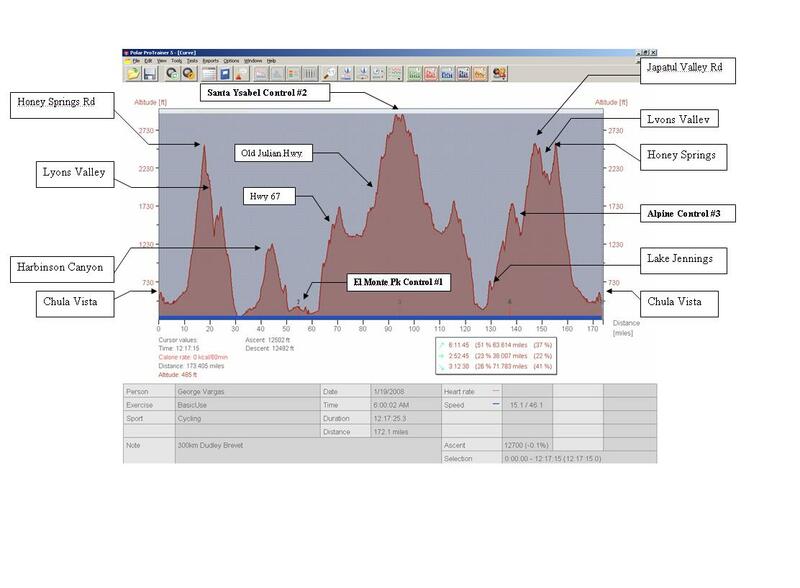 But then again Brandy and I are not average and we are about to endeavor on a 300km event with a lot of climbing. The average American won’t burn half the calories we will today. Two hours later we arrived at the ride start in Chula Vista. I felt rushed and I hoped I wasn’t forgetting anything. We took care of the administrative matters and lined up with at least 25 other riders. I was surprised to see so many riders on a 300km in January. The weather couldn’t be more perfect– clear skies and high 40’s F at the start. Before we rolled Brandy began medicating for a sore knee and her cold symptoms– something she would have to do regularly throughout the day. We roll out of the Von’s parking lot as Tail End Charlie, was it an omen? The first two blocks was up a slight grade (1-2%) and we begin to pass riders. I felt a duty, a responsibility, as the only tandem, that we should lead out the ride through Otay Lakes Rd until the first climb–Honey Springs Rd a 6.5% 7 mile climb. But on the first little dip I tried working the Rear Der down the cassette and got NOTHING. We pulled over and I began the usual troubleshooting. I thought I fixed it so we rolled off. The pack is long gone by now. Once on the road I realized it’s still not fixed and we pulled over again. This time I take a little more time to troubleshoot. I find the culprit. The cable housing under the bike (under the Captain’s Bottom Bracket) is seized around the rear der cable. I break it free and try to reposition the cable and housing in the cable stops but the plastic inner sleeve has separated from the cable housing. I then remembered that I was carrying a Swiss Army knife.. My friend from Switzerland (no– really!) gave to me as a present–thank you Lukas. I typically don’t bring a knife on my rides, but this morning as I was taking the trash out I passed by my car and remembered I had a knife in my trunk I’ve never used it but said “Hmmm…maybe I should take a knife”. I cut the sleeve and reinstalled the cable. Notice the Nathan reflective gear on our ankles and helmets. Why was the cable seized up? It had rained on us on the 200km. I had washed the bike and lubed the chains (talkin’ about a tandem here–folks there are TWO of them) but apparently I need to lube the cables as well after rainy and muddy rides. We are now more than 45 minutes behind the last rider. It is only 1.5 miles into the brevet. Mentally, I’m going through the scenarios of how late tonight we will finsh. Also my goal was to get to the base of Hwy 67 (about 60 miles with about 4,500 ft) before it got too hot. It is a long slog of a climb from Lakeside to Ramona and then to Santa Ysabel. It is 30 miles of up and up with rollers ( see graph above) but basically it climbs up to 3,000 feet from below 500ft. I even considered calling it a day since the day was not off to a good start. On Dehesa Rd, we run into our friend Pete Masiel. We stopped and took pictures since we were so behind the pack what was the point on killing ourselves (another 10 minutes). We reach the first control and take some electrolytes. As I’m getting our brevet cards signed I see Brandy taking another dose of Ibuprofen and some cold medicine. It took us 5 hours to do 55 miles and 4700 feet. It was a short stop probably less than 10 minutes. About 1.5 miles into the climb up Hwy 67— POP!! We get FLAT #1. It was a buttonhead screw sitting on it’s buttonhead. I didn’t see it until I was right on top of it. I missed it with the front wheel but the rear tire wasn’t so lucky. Of course, the flat happens on a narrow shoulder. We pick up Pia and get on the other side of the guard rail. I removed the tire and noticed it had a small cut. I install a tire boot and we get back on the road. We are on mile 66 and 4900 feet of gain. We climb into Ramona and while cruising down Dye Rd I ask Brandy if the rear tire looks flat or feels flat to her. Sure enough the rear tire was flat again. FLAT #2. I change the flat and as I’m putting the wheel back in I inadvertently knock one of the disc brake pads out of the rear brake caliper. I didn’t know what it was at the time. But as I finished with the installation of the rear wheel– it just didn’t feel right. That’s when I noticed that one of the pads was missing. I found it laying on the ground. I tried to reinstall it but I later found out that I bent the spring as I was putting it back. Notice the DETOURS HIGH TAIL SEAT POST MOUNTED BAG. You can load an awful lot of stuff for brevet riding in this bag. I had only brought two tubes and two CO2’s with us. I don’t usually flat. 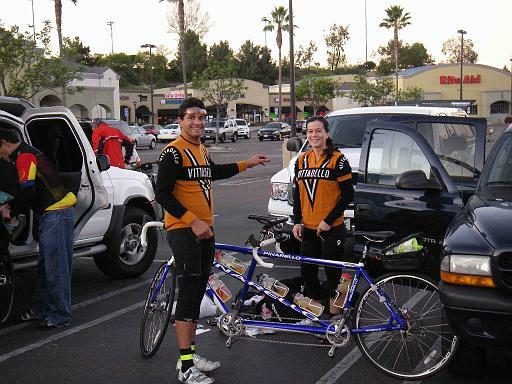 But I have to adopt the mindset that we are now a 280lb tandem team. As such, we won’t roll over the stuff I normally do when I ride solo at 155lbs. We get back on the road but the rear disc brakes are rubbing. I was also worried because we were out of spare tubes and CO2. I decided we need to regroup play it smart and get some repair work done on the tandem and buy more flat repair stuff. 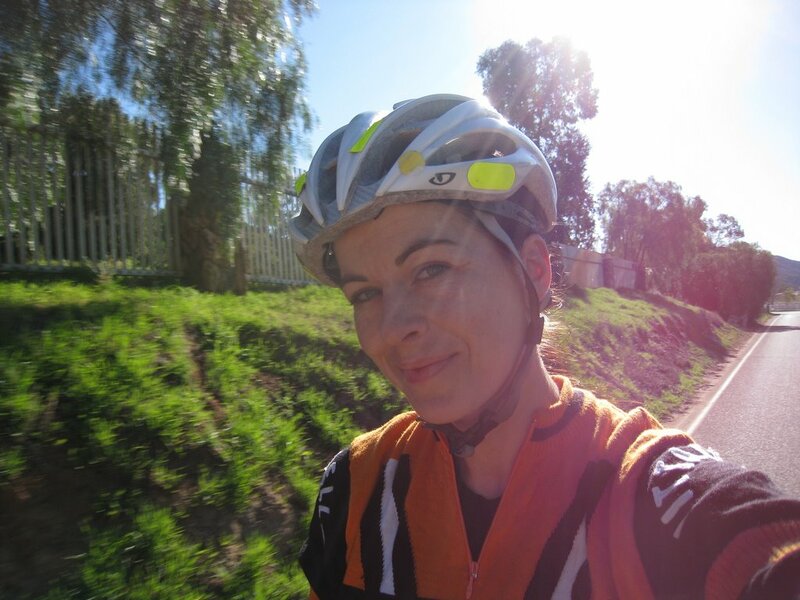 We go off-course to find Kirk’s Bike Shop in Ramona. To most people, Randos look like people from another planet. We have, what seems to them, far too much gear on us and on our bike. Our bikes aren’t sleek racing machines nor are they loaded down touring bikes. We are “tweeners” not racers not tourers but who are are we really? Some of us race the brevets and some just want to finish we’re an odd lot. 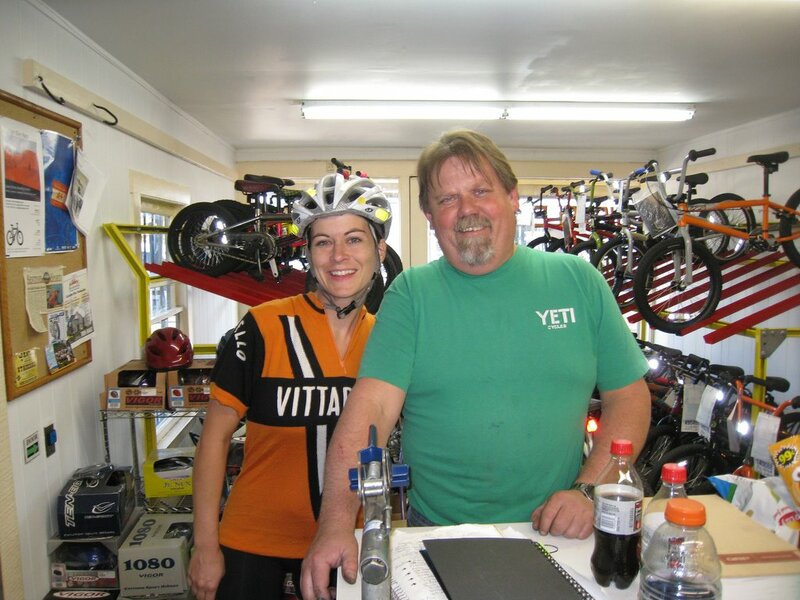 We walk into Kirk’s with our tandem, a Pinarello tandem, and no one has ever seen one before. I think that’s kind of cool. I ask for the mechanic and a gentlemen tells me, “He’ll be with you soon he’s selling a couple of bikes.” My frustration is evident but I try to play it cool. Kirk, the proprietor, is selling two beach cruisers. We have to kill some time until our number is called so we walk across the street to a liquor store to get something cold to drink. While there we take pictures with a girl selling some alcohol something or other and head back to the bike shop. When we return to the shop, Kirk is putting our beast of a bike in his repair stand — with the help of three other people. Along with the “brake job”, I also lament to him that the rear derailleur shifting has been off all day. It’s at least 3:45pm (Total Brevet time 8 hr 45 mins) and we have only done 80 miles. We were at Kirk’s at least 45 mins. I bought his last three (3) threaded CO2’s. I also bought three tubes just in case . While there we get a call from Mike Berry, the RBA. And then he actually paid us a personal visit. Isn’t that something? We leave the bike shop and about a mile later POP! FLAT # 3. Can this really be happening to us? I change the flat and get back on the road. 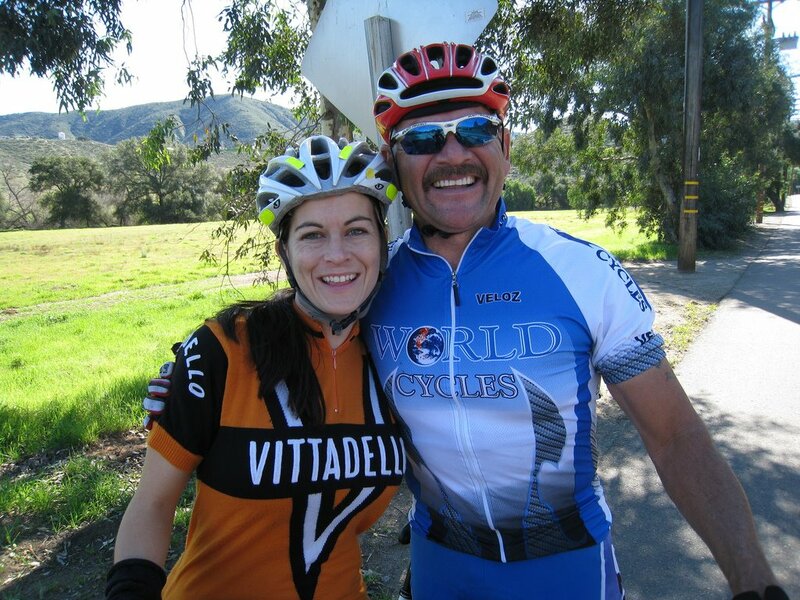 I love Old Julian Hwy and it was great to show Brandy the great backcountry of San Diego County. We arrive at Santa Ysabel and there’s Mike B, Tom and Tina Reynolds and Tom Parkes. The only good thing about being Tail End Charlie is you get to finish off Tina’s homemade soup and bread. I think it took us 10 hours to get to Control #2 at mile 96. It was starting to get cold and the sun was setting fast. 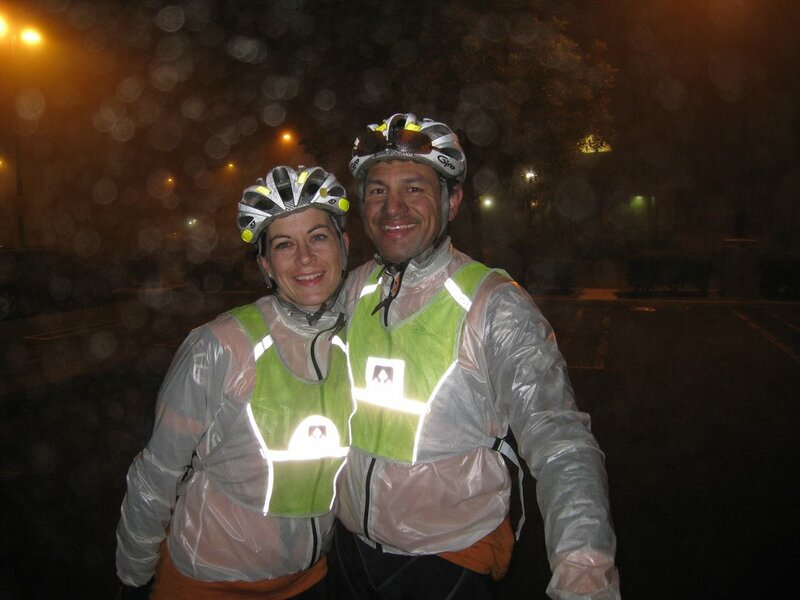 We put on all our cold weather and Nathan Reflective gear that had been stuffed all day in the Detours High Tail. One of the last pictures we took was at 5:46pm. I think we left within 5 minutes of that picture. Don’t we look smashing? Thanks to Nathan Sports for the reflective gear. You might have noticed our ankle bands and of course their reflective vests. Thank you Nathan. The route has a lot of descending ALL the way back to Lakeside. It was nice to get the big gears rolling again. It was also important to get out of elevation and the cold. It was warmer in Lakeside plus we were no longer creating our own wind chill factor speeding down Hwy 67 at 50mph. Once in Lakeside we climbed up to Alpine. The climb on Japatul Rd was weighing heavy on my mind. I knew it was the hardest and steepest climbing of the day. It was on the back end of the course and our largest cog was only a 28T rear cog. On the climb to Alpine I couldn’t believe my eyes– there were blinkies up ahead. After 14 hours of riding– off-the-back mind you — I am finally seeing the tailights of other riders. As we pass Mark S. we say a few words to him and another rider and we press on to Carl’s Jr., our next Control. On the crest of the climb I see Milly Valdez and Alonso Gomez heading out to Japatul Valley Rd. At Carl’s Jr. we at least two other riders there. We grab a couple of burgers, our valuable receipt and head out. I felt bad for rushing Brandy out of the Carls Jr. control. I had a couple of reasons. I know how comfy a warm place can be after being on the bike for that many hours. But I strongly believe taking off the chill is all you need– don’t wait until you get warm. The second reason was I know the Japatul Valley Rd climb. I lived in Santee and I would torture myself on that road a couple of times a week. The climb has a good number of steep grades and rollers the give you false hope as you drop only to pitch up again– steeply. In addition, since it was after 9pm I knew it was only going to get colder. Luckily, on this brevet route we wouldn’t be doing the entire Japatul Valley Rd climb. We turned off of Japatul only about 6 miles into it. After our Lyons Valley turn off there is still about 7 more miles of steep undulating terrain climbing all the way to the I-8 freeway. I was surprised at how well we did on the steep rollers. We have an 11-28 SRAM Cassette and it seems to be working out for us. I was even more surprised when we came up on Alonso Gomez. I was sorry to hear that he DNF’d so close to the finish. Had I known he was that close to the edge I would have stopped, talked to him and motivated him to go on. We passed him just as we were nearing the right turn onto Lyons Valley only 27 miles from the finish. The descent on Lyons Valley was Brandy’s favorite part of the ride she told me later. I wish we could have done that in daylight. It is one of my favorite roads out there. I later found out that Milly Valdez was on the side of the road and was impressed with our descending speed in the dark of night. It is very invigorating to descend on the tandem at 50+ mph into the darkness. The NiteRider Moab is your friend on dark nights. The amount of light the Moab puts out and the beam pattern is incredible. I feel very safe descending at high speeds in the dark with the NiteRider Moab. Once we got under 25 miles I was doing the countdown of miles. I was also trying to calculate our finishing time based on pace, miles and terrain. Once we crested the little bumb of Honey Springs Rd I knew the last 15 miles were going to be easy going and mostly Big Ring Time! Otay Lakes Rd was really cold especially as we were going around the lake and it was the first time I had to put on my Showers Pass Pro Tech jacket. I love this jacket it so thin, easy to pack and so warm when you need it. It was nearing Midnight and I was glad I had another layer to put on. It was foggy as we came in to the finish. The fog made for a very fitting conclusion to our epic ride. Three flats, Rear Der issues, and Rear Disc brake issues and a lot of mental anguish being off the back for 14 hours of the 17 hours and 20 minutes but it was done and in the books. Getting flats were a huge delay because the flat repair was buried in the Detours bag. You would think we would learn our lesson after the first flat but how many flats do you think you will get in a day. By the second flat I thought we were done flatting. During the 300km this is what we had stuffed in the DETOURS High Tail bag– two Showers Pass Pro Tech jackets, two reflective vests, two sets of wool knee warmers, , 1 set of wool arm warmers, two sets of wool gloves, three tubes three CO2’s, a boot, a multitool, Swiss Army knife, cold medication, wallet, keys, cell phone, zip ties, black electrical tape and cold hard cash. This is the longest ride to date for Brandy and I on the tandem. I honestly didn’t believe riding a tandem could be so much fun. Brandy is so awesome as a stoker. Our teamwork is improving every ride in particular on our climbing out of the saddle. 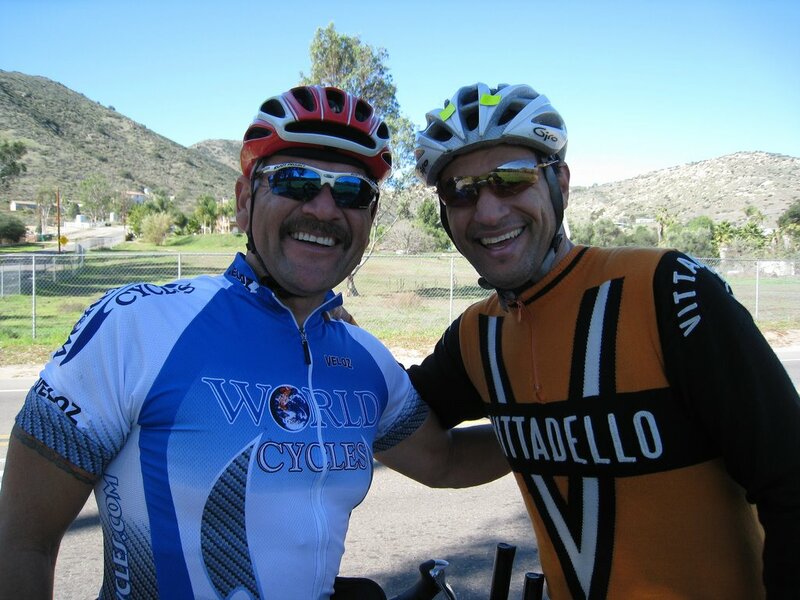 Riding the tandem is a lot more difficult on the climbs… well actually in every aspect except the descents. We joked and laughed for hours. We even role played as two characters to pass the time. I really enjoyed the 300kms, the 17+ hours, the mechanicals, and the laughs with my girl. Thanks to Mike Berry and all the volunteers who put on this great brevet series. We’ll see you at the 400km. This entry was posted in brevets, events, tandem by REV Cycling Directeur Sportif. Bookmark the permalink.